The development of lithographic printing in the later half of this century has been the result of extensive research into the preparation and use of the litho plate. The process of lithography was originally confined to stone slabs which were prepared for printing with the use of greasy drawing inks and crayons to form an image on the flat surface of the stone, and various chemicals applied to ensure that when inked, the non-image areas of the stone remained free from ink. Zinc plates were introduced by about 1820 to replace the cumbersome stone and by. 1860 a photographic process was being used to form an image on the plate instead of hand drawing. The use of zinc plate permitted the development of rotary presses and at the turn of the twentieth century an American developed a paper printing press with a rubber covered cylinder between the plate and impression cylinders of the conventional direct press. 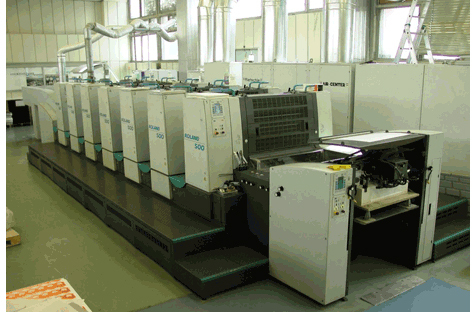 Thus offset lithography became the predominant method of printing from litho plates. Plate development was gradual. Aluminium plate was introduced in 1900 but its use limited because of serious oxidation problems. Lithoprinting remained a problem until the 1950's when anodising was applied to the surface of the aluminium plate and a new generation of litho plates was born. This development, coupled with the use of new light sensitive coatings, has led to the present popularity of lithography. IThe principle of lithography exploits the phenomenon that grease repels water. An ink-attracting, water repelling image is formed on the modern aluminium plate by photgraphic means. The non-image areas of the plate are rendered w ater- attracting by coating the plate. When processed, the plate is fitted to the cylinder of the offset press where it is first damped by cloth rollers and then inked by rubber rollers.